Biblioteca Digital de Castilla y León > Help › How to search information? NOW  › Help › How to search information? 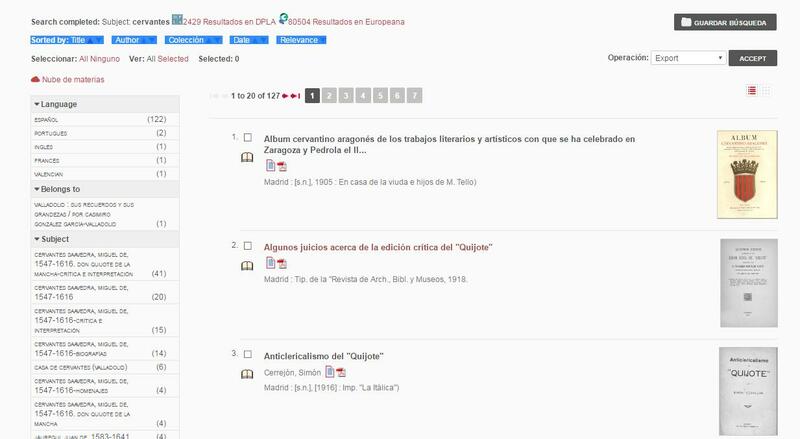 To make search easier for all users, the BDCYL offers the possibility of making advanced full-text search of all the printed items belonging to the collection. This advantage, which is based on the optical recognition of characters (OCR), multiplies the possibilities of recovering information and it allows to track down any person’s name, place, etc… appearing in any work’s pages. 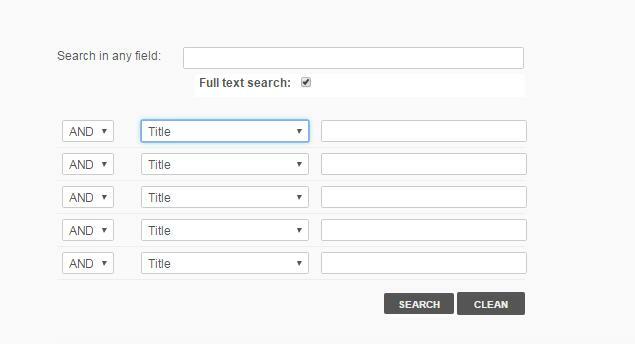 Advanced full-text search is done through the BDCYL home page or selecting “Advanced full-text search “option through the assisted catalogue search. Introduce the key word or words that you want to search separated by a blank space (in the search bar). Once the search is done, the items founded appear on each page. To enlarge the image click the symbol. The result tab will show the searched word(s) highlighted in yellow. Later the user can access the work’s bibliographic details by clicking the title. And the user can go directly to the complete text by clicking which allows downloading the document. BDCYL works can be searched in the catalogue option found in the main menu. The user has different search types. This easy search allows looking for any word(s) that appears in the field of the form. • Year of publication: search by specific year or year range. To search for a sentence use quotes, e.g. "Conde de Benavente". The characters (*) and (?) can be used for partial or prefix searching. For instance, “ilustr*” will recover words such as illustration, illustrative, etc… However, these characters should not be used at the beginning of the search. Advanced Search allows searching with one or more fields. Searching with more fields than one will be combined with Boolean software (Y, O, NO). This search is recommended for more precise results. Y It traces results that contain both searched terms. O It traces results that contain either both of the searched terms or one of them. NO It traces results that contain the first searched term but not the second. First select a field and a term then choose the search method (Y, O, NO) and finally click “Search”. The fields that you can choose are: any field, author, tittle, place of birth, editor, year of edition, century of publication, subject, serial number, notes, press-marks, copys notes, language, type of resource and library. 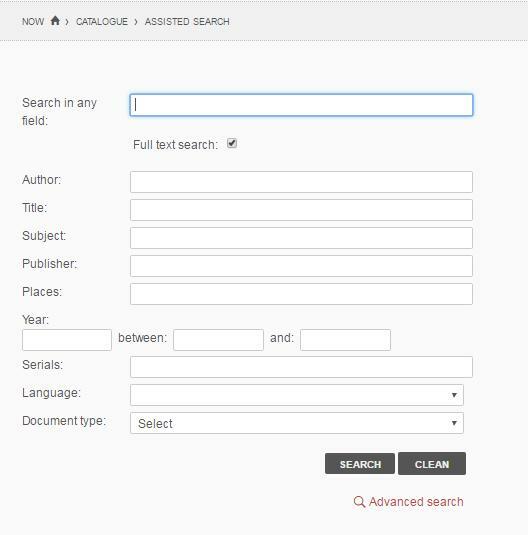 Both the Assisted Search and Advanced Search can combine with the library subject collections. 2.3 List of authors, titles, places and subjects/ topics. These lists are organized in alphabetical order and they show between 20 and 40 results on each screen. There is the possibility to go from screen to screen through arrows, selecting a page or selecting all the results that start with a letter. The place list allows searching resources in which the subject is the described geographical area. 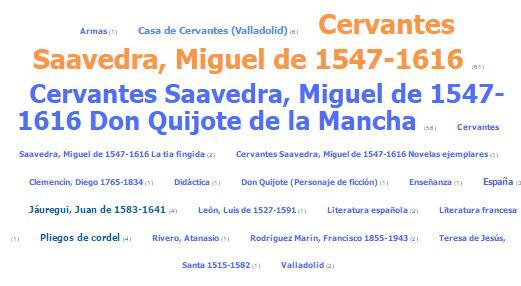 It helps to search the titles describing villages, villas and cities from Castilla y León. It is possible to link these results to the selected resources. Besides, next to each result there is the number with all the linked resources. This way of accessing the library resources can be less precise; however, it can give the user a wider knowledge about the existing resources in the BDCYL. Magazines and newspapers can be found by the title in the alphabetic list and by the edition date. Calendar, limiting to a year and a specific month. Search between two specific dates. Number without date, recovers the serials without chronology. When doing a search the results list is shown. The results are display in alphabetic order. However, the user can select how to organize the results. They can be organized by different fields, according to the user’s needs, and both alphabetically ascending and descending. Another option is that the resource is linked to an external URL where the digital copy is. In this case it will be shown with the icon. To select the wanted resources by clicking the check-box appearing at the beginning of the resource’s entry. To display the entire bibliographic resource by clicking on the title. Subjects cloud. It is the graphic display of the assigned subjects to the resources obtained in the search. Each term appears with the number of resources (between parentheses) that has been assigned. This way, according to that number, the terms will appear in a different letter colour and size. By clicking on one of the terms, all the assigned resources will be shown. The terms shown are accepted entries, without subdivisions. BDCYL results are fed with the recovery of the resources located in the simultaneous search from the Digital Public Library of America (DPLA) and Europeana, the digital European library collections. All the records appearing in the search results can be exported, but the user has to select the format. Downloading the record to save it on a hard drive or USB. Once the options are selected the user will have to click on “export”. From this section the option of exporting the current record or all the records is also available. From the link leading to the digitized resource the user will be able to access the images visualization screen and consult the resource. Download / print: With this option the images can be saved in PDF or jpg format. If they are saved in PDF format the user will be able to save the whole document or just parts of it. If images are saved in jpg the user will only be able to save that selected page. Once the images are saved the user has the possibility to print them or download them. When one of the images is selected the program allows to visualize page by page, to increase and decrease the size and to turn both clockwise and anti-clockwise, among other options. By clicking this option this window below is shown. A permanent link to the visualized document is obtained so that if the URL is copied and then pasted in the browser the user will be able to access directly to the consulted document. It is a way to allow direct Access to the images of a particular document.